Toad Tote is one of the three minigames in Super Princess Peach. 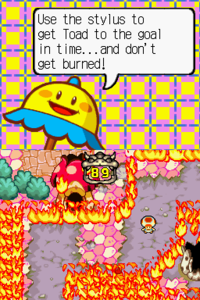 In this minigame the player must drag Toad through a fiery environment using the Stylus. The player will lose the minigame if they run out of time or lets Toad touch the fire or spikes. There are ten levels of increasing difficulty where it gets harder and harder to get Toad through the maze without getting burned or timing out, however the rewards get better as Toad gets through each maze. Obstacles in this minigame include Fire Walls, Spinning Flame Ropes, and Flame Ghosts. The color of the fire also changes from level to level. It changes between red, green, blue, and purple. This page was last edited on October 14, 2018, at 16:39.